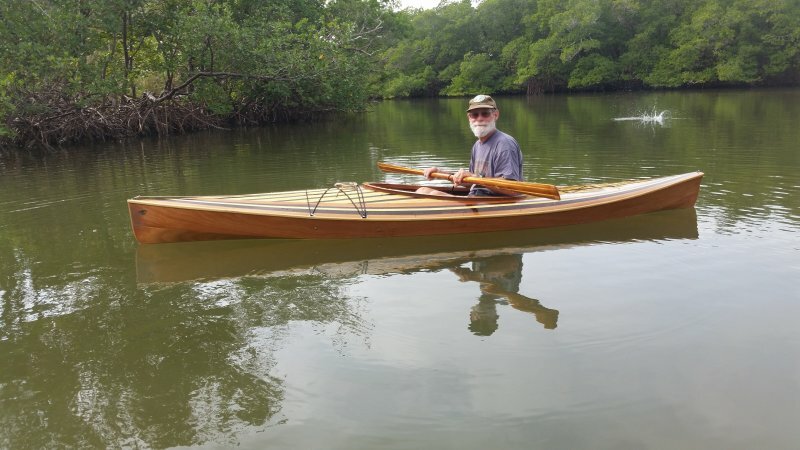 My Kayak is a Chesapeake Light Craft “Wood Duck Hybrid.” I started the build on 11/6/14 and completedit on 12/30/14. It took approximately 185 hours to complete the kayak, including time spent on making a “Greenland Paddle” and a few mistakes that needed to be rectified! I live in South West Florida and this boat is perfect for the conditions here. I launched it in the Gulf of Mexico and have used it in open water as well as a run (both down stream and up stream) on the Loaxahatchee River. near Jupiter, FL. That was through cypress swamps, with tight turns and significant current. She performs beautifully! I have been paddling a CLC “Severn” for 21 years and this kayak handles better in those conditions.